Virus-like particles (VLPs) formed by the human papillomavirus (HPV) L1 capsid protein are currently being tested in clinical trials as prophylactic vaccines against genital warts and cervical cancer. The efficacy of these vaccines is critically dependent upon L1 type-specific conformational epitopes. To investigate the molecular determinants of the HPV16 L1 conformational epitope recognized by monoclonal antibody 16A, we utilized a domain-swapping approach to generate a series of L1 proteins composed of a canine oral papillomavirus (COPV) L1 backbone containing different regions of HPV16 L1. Gross domain swaps, which did not alter the ability of L1 to assemble into VLPs, demonstrated that the L1 N-terminus encodes at least a component of the 16A antigenic determinant. Finer epitope mapping, using GST-L1 fusion proteins, mapped the 16A epitope to the L1 variable regions I and possibly II within the N-terminus. These results suggest that non-contiguous loop regions of L1 display critical components of a type-specific, conformational epitope. Cervical carcinoma is the second leading cause of cancer deaths in women worldwide and approximately 500,000 new case are diagnosed annually. While regular cytological screening has greatly decreased mortality rates in developed countries, the death rates for this cancer in developing countries remains high due to the limited availability of reliable screening and medical follow-up. Clearly a preventive approach to this cancer is a feasible and desired goal [1–6]. Animal studies have demonstrated that vaccination with the papillomavirus L1 protein is highly efficacious in preventing experimental viral infection and tumor formation [7–11]. As a consequence, human trials are now in progress to assess the ability of this vaccine to combat cervical cancer [4–6, 12, 13]. 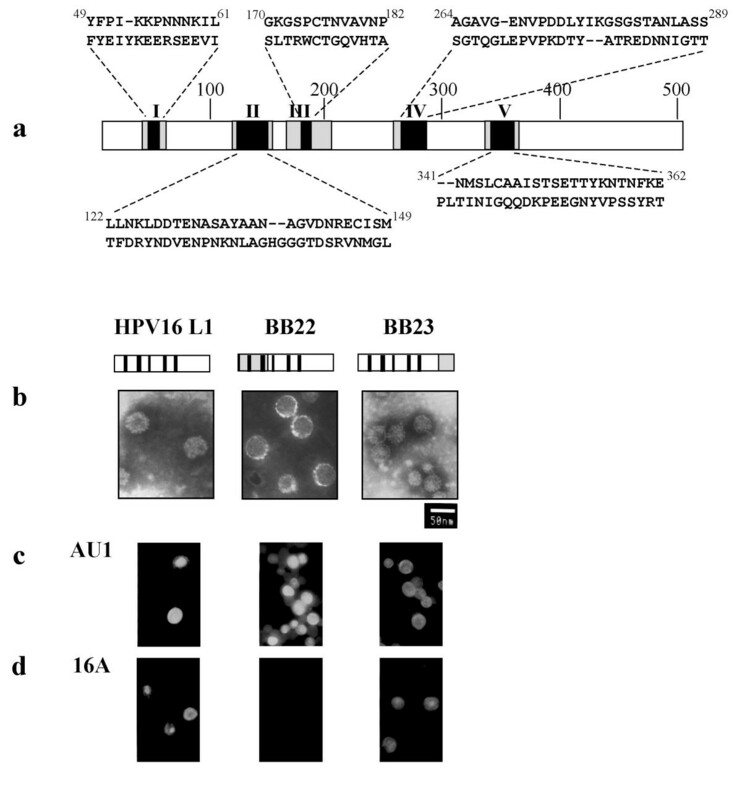 Serological studies of papillomavirus virus like particles (VLPs) demonstrate that antibodies cross-reactive with multiple HPV VLP types recognize type-common epitopes and generally are not neutralizing. This has been shown with both monoclonal antibodies and with polyclonal sera [14–20]. In these studies, only highly homologous HPVs, such as HPV6/11 and HPV18/45, induced cross-neutralizing sera and type-common epitopes were found to be less immunogenic than type-specific epitopes. These observations have also been made in studies of human sera. Women infected with one HPV type are not cross-protected against infections with other HPVs and frequently, multiple HPV infections co-exist in the same patient [21–24]. This suggests that different papillomavirus genotypes may represent different serotypes and that neutralizing antibody responses to different papillomaviruses are type-specific. Although HPV16 is the most common HPV type implicated in cervical cancer development, as it is detected in 50% of cervical cancers , other high-risk HPVs comprise the remaining 50%. The future vaccine will have to be multivalent in order to provide adequate protection, perhaps consisting of a cocktail of different HPV neutralizing epitopes. For the successful development and implementation of a broadly protective, prophylactic HPV vaccine, an understanding of the apparent serotypic-specific immune responses to different HPVs is paramount. The recently published crystallography model predicts the existence of loop structures that are displayed on the surface of assembled capsomeres . Sequence alignment of 52 papillomavirus L1 proteins from different host species demonstrates that there is considerable homology with the exception of 5 hypervariable regions, each ranging from 10 to 30 amino acids in length and located within a surface-exposed loop. Both conformational and linear papillomavirus epitopes recognized by neutralizing antibodies have been mapped to the loops [14, 26–34]. The loop domains can also present non-L1 peptides and direct immune responses specifically toward these foreign peptide sequences [34–37]. Not only do the papillomavirus loop sequences display potentially virus-neutralizing B cell epitopes, but the manner in which they are presented to the host immune system makes them highly immunogenic. Given that the crystallography model predicts the hypervariable regions to be displayed as surface-exposed loops and that the loops are highly immunogenic, it is quite likely that the loop epitopes are the determinants of type-specificity. To directly address the issue of type-specificity, we utilized a domain-swapping approach to generate a series of L1 proteins composed of a canine oral papillomavirus (COPV) L1 backbone containing different regions of HPV16 L1. Specifically, both gross and fine domain swaps were performed in which different combinations of the 5 hypervariable regions from the surface-exposed loops of HPV16 L1 were homologously swapped onto a COPV L1 backbone (Figure 1). This particular combination of L1s was chosen for several reasons. First, HPV16L1-specific monoclonal antibodies are available. Second, gross HPV16-COPV L1 chimeras have been expressed as VLPs , indicating that enough homology exists between the divergent L1s to direct proper folding. Third, the COPV L1 backbone is of a different animal papillomavirus type and therefore might provide the optimal signal-to-noise ratio. Studies have been done on HPV hybrids [28, 32, 33] and given the relative degree of conservation between these HPV L1s, the resolution of these mapping studies may be a confounding variable. We chose to test our hypothesis by using the HPV16 VLP-specific antibody 16A, which recognizes a surface-exposed, serotype-specific, conformational epitope ( and unpublished observations). Our study suggested that the epitope recognized by the HPV16 VLP-specific antibody 16A resides on the hypervariable regions of loops I and possibly II. The HPV16 VLP-specific monoclonal antibody 16A binds to intact HPV16 VLPs. The immunological properties of the HPV16 L1-specific monoclonal antibody were characterized by ELISA. Optical density values are plotted. 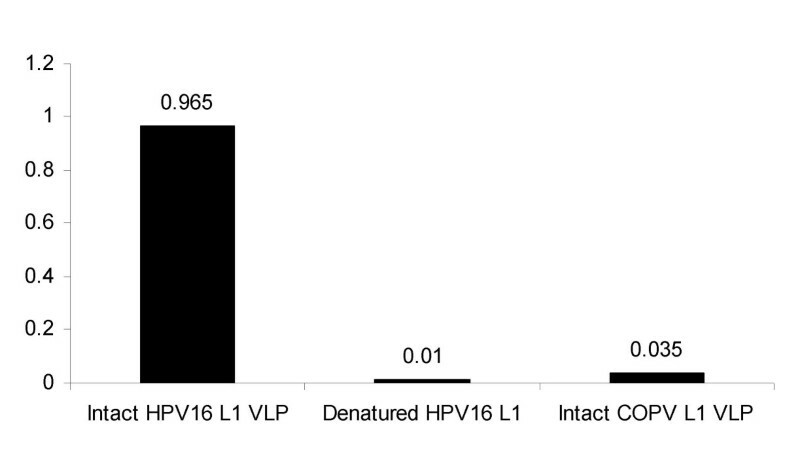 The immunological properties of the HPV16 L1-specific monoclonal antibody 16A  were characterized by ELISA, the results of which are shown Figure 1. The monoclonal antibody 16A is strongly immunoreactive with intact HPV16 L1 VLPs, but is non-reactive with either denatured HPV16 L1 protein or with intact COPV L1 VLPs, demonstrating that 16A recognizes a conformation-dependent epitope presented on the surface of intact HPV16 VLPs. 16A does not react with HPV18, HPV11 or HPV6 VLPs (unpublished observations). This monoclonal antibody is not neutralizing (data not shown). The recently published crystallography model predicts the existence of loop structures that are displayed on the surface of assembled capsomeres . A diagram of the relative positions, corresponding amino acids and numerical designations for the 5 hypervariable regions of the surface-exposed loop domains of L1, is shown in Figure 2a. To evaluate the role of various L1 domains in conformational epitope formation, chimeric L1 proteins expressed in Sf9 cells were tested by immunofluoresence microscopy using the HPV16 L1-specific, conformation-dependent monoclonal antibody 16A (Figure 2d). BB22 is a hybrid protein in which the first 169 amino acids of COPV L1, encompassing hypervariable regions I and II, replace those of HPV16 L1. Thus, the chimera contains COPV L1 hypervariable regions I and II and HPV16 L1 hypervariable regions III, IV and V. In BB23, the ultimate C-terminal 106 amino acids are of COPV L1 origin, and therefore, all 5 HPV16 L1 hypervariable regions are present. To evaluate whether the chimeric L1 proteins can still assemble into VLPs, particles were purified from Sf9 cells expressing wild-type, BB22 or BB23 L1 constructs and visualized using transmission electron microscopy (TEM). BB22 and BB23 form VLPs similar in size and shape to that of wild type HPV16 L1 (Figure 2b). Immunofluorescence microscopy of Sf9 cells infected with recombinant baculoviruses expressing wild type and chimeric L1 and electron microscopy of wild type and chimeric VLPs. a, A diagram of the relative positions, corresponding amino acids and numerical designations for the 5 hypervariable regions of the surface-exposed loop domains of L1. For each aligned amino acid sequence shown, HPV16 L1 is represented above the appropriate COPV L1 sequence; the amino acid positions of the 5 HPV16 sequences are indicated as superscripts. For example, in the all five loop swap D12345 GST-L1, each of the 5 hypervariable HPV16 L1 domains replaces the corresponding COPV L1 hypervariable domains on a COPV L1 backbone. The COPV L1 backbone is not shaded. The hypervariable regions of L1 are numbered and shaded black. These fall within the surface-exposed loop domains, which are checkered gray. b, Electron micrographs of wild type and chimeric VLPs are shown. Size bar represents 50 nm. In the BB22 and BB23 L1 diagrams, the hatched regions represent the swapped COPV L1 amino acids. The hypervariable regions are designated as thick black lines. The HPV16 L1 portions are unshaded. c, d, Sf9 cells were seeded onto coverslips in plastic plates and infected with the designated recombinant baculoviruses for 3 days. Immunofluorescence microscopy was performed as described in the text. c, Samples stained with conformation-independent antibody, anti-AU1, were used as a control for protein expression; HPV-16 L1 protein was used as a positive control for the various antibody reactions. d, Immunofluorescence with monoclonal antibody 16A. The conformation-independent monoclonal antibody, AU1, which recognizes a linear, 6 amino acid epitope found at the C-terminus of many different papillomavirus L1 proteins was used to detect expression of L1 constructs in Sf9 cells. As shown in Figure 2c, the expression level of the wild type HPV16 L1 and the different chimeric proteins were similar. Figure 2d demonstrates that BB23 is immunoreactive with antibody 16A in a pattern similar to that of wild type HPV16 L1, whereas BB22 is non-reactive. Taken together, these results suggest that the epitope recognized by 16A may be located within the first 169 amino acids of HPV16 L1. However, they do not exclude the possibility that other regions of L1 might be involved in the formation of the 16A epitope. To directly investigate the hypothesis that the hypervariable regions of the loop domains are involved in the formation of type-specific, conformation-dependent epitopes, the 5 discrete hypervariable regions from the surface-exposed loop domains of HPV16 L1 were homologously swapped onto the COPV L1 backbone. Due to the ease of preparation, the GST-L1 fusion protein method was used to complete the study. After purification, GST-L1 fusion proteins assemble into capsomeres [7, 41]. The GST tag neither interferes with capsomere assembly, nor with epitope presentation, as the GST-L1 preparation was protective as a vaccine . The morphology and size of D12345 GST-L1 capsomeres is comparable to wild type COPV GST-L1 and HPV16 GST-L1 capsomeres (Figure 3a). As electron microscopy only evaluates morphology, sucrose density sedimentation analysis was used to verify that D12345 GST-L1 was assembling into capsomeric structures. It has been shown that COPV GST-L1 capsomeres sediment from 12–16 S . Figure 3b illustrates that around 45% of the D12345 GST-L1 preparation forms capsomeres (i.e. the peaks around 14 S). This is similar to wild type COPV GST-L1 capsomeres, of which roughly 50% assembles into capsomeric structures (Figure 3c and ). To confirm that the structures with the predicted S value for capsomeres retained the morphological characteristics of capsomeres, TEM analysis was performed on the peak fractions. Capsomeres were seen in the peak fractions for both COPV GST-L1 and D12345 GST-L1 (data not shown). D12345 GST-L1 forms capsomeres as demonstrated by two independent techniques and retains immunoreactivity with monoclonal antibody 16A. a, TEM of D12345 GST-L1 showing capsomere formation. TEMs of COPV GST-L1 and HPV16 GST-L1 capsomeres included for reference. Size bars represent 100 nm. b, Immunoblot of D12345 sucrose density gradient fractions with anti-AU1, with peaks for protein sedimentation markers indicated as arrows and corresponding densitometry analysis shown below. c, COPV GST-L1 as positive control. Immunoblot of COPV GST-L1 sucrose density gradient fractions with with anti-AU1. Standards are indicated as in b, and corresponding densitometry analysis is shown below. The amount of GST-L1 in the fractions was plotted as the percentage of total GST-L1 protein. Protein standards used were hemoglobin (4.5 S), catalase (11 S) and beta-galactosidase (19 S). d, Quantitative ELISA testing the immunoreactivity of D12345 GST-L1, HPV16 GST-L1 (positive control) and COPV GST-L1 (negative control) with the anti-HPV16 VLP monoclonal antibody 16A. A representative example of 2 independent experiments is shown. As shown in figure 3d, 16A was comparably immunoreactive with HPV16 GST-L1 and D12345 GST-L1. By contrast, COPV GST-L1 was not recognized by 16A. This indicated that the 16A epitope was present within the HPV16 L1 hypervariable loop regions, as the homologous replacement of the COPV L1 hypervariable regions with those of HPV16 L1 transferred immunoreactivity to the chimeric L1 molecule. In order to delineate the HPV16 L1 hypervariable regions recognized by 16A, a panel of COPV-HPV16 L1 mutants was constructed, purified and characterized (Figure 4a). The electron micrograph for each mutant demonstrated capsomeric structures of the same size, and morphology as seen previously with COPV GST-L1, HPV16 GST-L1 and D12345 GST-L1 (data not shown). The sucrose gradient sedimentation profiles are comparable to D12345 GST-L1, with 58–71% of the various mutants from each preparation assembling into structures with the same S value as COPV GST-L1 capsomeres (Figure 4a and data not shown). An anti-HPV16 VLP type-specific monoclonal antibody recognizes a conformation-dependent epitope presented by loops I and II. a, Capsomere assembly was verified via SDG analysis and by TEM (data not shown). Percent capsomere assembly was determined as per SDG approach with final results as indicated. b, Quantitative ELISA testing the panel of loop swap mutants, HPV16 GST-L1 (positive control) and COPV GST-L1 (negative control) with anti-HPV16 VLP monoclonal antibody 16A. The immunoreactivities of all these capsomeric preparations were measured by ELISA. 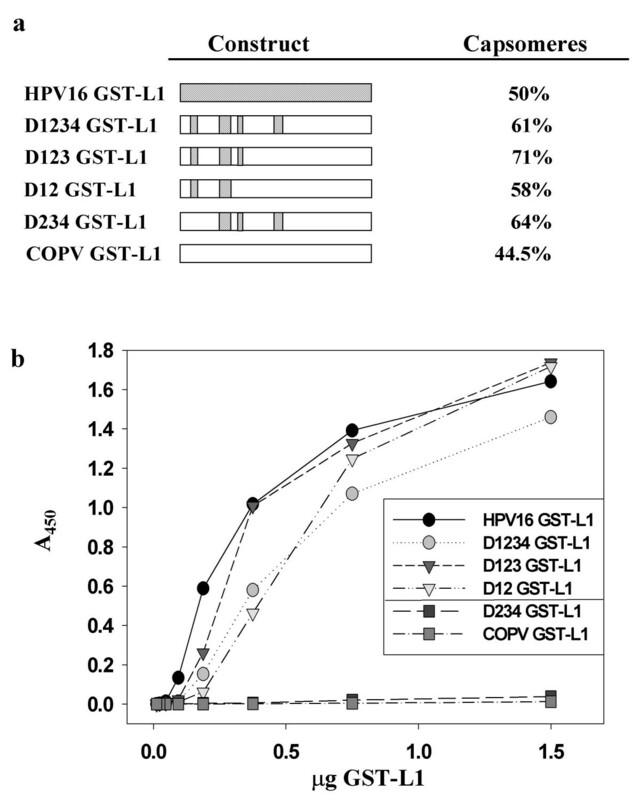 The various loop swap mutants D12345 GST-L1, D1234 GST-L1, D123 GST-L1 and D12 GST-L1 retained virtually identical immunoreactivity with 16A and displayed reaction kinetics that were comparable to HPV16 GST-L1 (Figure 4b). However, D234 GST-L1 was not reactive with 16A. These results suggest that HPV16 L1 loop domains I and possibly II display critical components of the type-specific, conformational epitope. Characterization of surface, conformation-dependent antigenic epitopes on the papillomavirus capsid is important for understanding early virus/host interactions and for the development of effective papillomavirus vaccines. Due to their discontinuous nature, mapping these conformational epitopes has been very difficult. However, the sequence homology between the different types of papillomavirus L1 proteins together with the recently published crystallographic model provide a methodology for mapping the conformational epitopes by a domain swap approach. To evaluate the role of these various domains in the formation of type-specific, conformational epitopes, we used the domain swap approach to construct both gross and discrete HPV16-COPV L1 chimeras. Initial experiments indicated that the hypervariable regions within the first 169 residues of HPV16 L1 might contain the 16A epitope, however the participation of other HPV16 L1 residues in the formation of this epitope could not be ruled out. The next approach chosen to study the L1 loop domains was to swap out the 5 hypervariable regions of COPV L1 and homologously replace them with the 5 corresponding hypervariable regions of HPV16 L1. Once the construction of D12345 GST-L1 was complete, the structural properties of this mutant needed to be characterized, as the complexity of L1 protein folding makes accurate predictions regarding assembly difficult. Gross morphological analysis by TEM demonstrated that D12345 GST-L1 assembles into capsomeres. The sucrose density gradient experiments were subsequently used as a more stringent method of structural analysis and revealed obvious differences in the gradient profiles of wildtype COPV GST-L1 compared to D12345 GST-L1 capsomeres. Although both are bimodal, D12345 GST-L1 contains structures that peak after 19 S, whereas the second peak for COPV GST-L1 is toward the pellet. This suggests that structural alterations occur when the HPV16 L1 loops replace those of COPV, and this may account for the different sedimentation profiles. Perhaps the heavier structures found in fraction 10 contain different L1 monomer packing characteristics such that their density is greater and/or that their size and/or shape is altered. Protein preparation heterogeneity might also play a factor, and this becomes a more likely candidate explanation when the gradient profiles of the loop swap mutant panel are taken into consideration. Depending on both the mutant as well as the preparation, 50–71% of the proteins in the various samples assemble into structures with the S values predicted for capsomeres, demonstrating the variable contribution made by protein in the second peak to the total protein in the sample. Due to technical difficulties, it was not possible to analyze the immunological properties of the various sucrose gradient fractions. 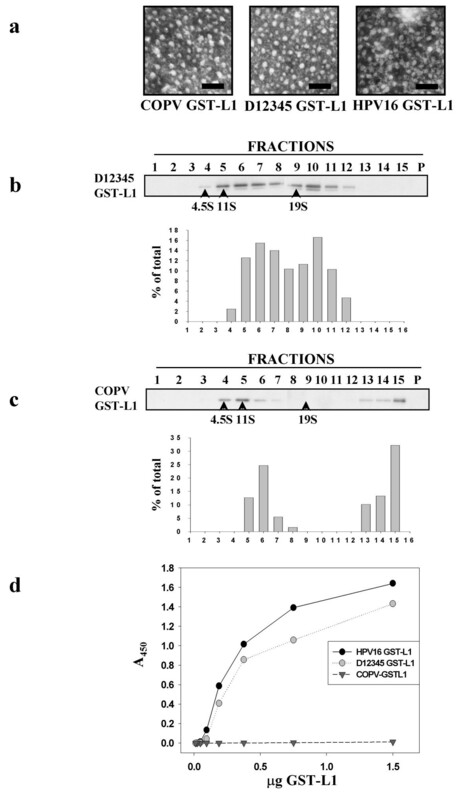 As both TEM analysis (data not shown) and Western blotting of the various fractions indicate that capsomeres assemble (Figure 4a and data not shown), and because chromatography-purified GST-L1 proteins are immunoreactive with L1-specific conformation-dependent antibodies, further investigation into the etiology of the bimodal peaks was not pursued. Although it might be argued that the chromatography fractions contain mixtures of both capsomere and non-capsomere fractions and that this may somehow affect conformation-dependent antibody-binding, this is not likely. If anything, slight structural perturbations would have a negative impact on conformational epitope presentation. Thus, while the loop swap mutants display characteristics that might be attributed to something biologically relevant, such as altered assembly properties, or to something insignificant, such as preparation heterogeneity, it should be emphasized that regardless of the properties of the heavier structures, at least 50% of the various purified mutants contain structures with the expected sedimentation coefficient for wild type capsomeres, and this is comparable to the result obtained with COPV GST-L1 (also see ). 16A was not immunoreactive with COPV GST-L1. Therefore, the transference of immunoreactivity of 16A to D12345 GST-L1 confirmed that the 16A epitope is located within the HPV16 L1 hypervariable regions. In D234 GST-L1, the replacement of HPV16 hypervariable region I with COPV hypervariable region I abolished 16A immunoreactivity, implicating the first hypervariable region of HPV16 L1 in epitope presentation. However, it did not rule out that the second hypervariable region might also contribute to antibody binding. To conclusively demonstrate that the epitope of 16A is located within the hypervariable regions I and II of HPV16 L1, this would require a lack of immunoreactivity of 16A with D1 GST-L1. Due to technical difficulties, we were unable to purify mutants containing HPV16 loop I but lacking HPV16 loop II. Multiple attempts were made to purify such mutants, including D1 GST-L1, D15 GST-L1 and D13 GST-L1, but the yields were extremely poor. Extensive precipitate formation was seen with these mutants after overnight dialysis, indicating that these mutants were adopting non-native conformations. Attempts to modify various conditions in the purification protocol all proved unsuccessful. The difficulties in purifying loop swap mutants containing HPV16 domain I but lacking HPV16 domain II suggest that a crucial, structural interaction may occur between HPV16 domains I and II such that successful protein folding of any loop swap mutant containing HPV16 domain I requires that HPV16 domain II also be present. This interaction may be biologically relevant or it may have to do with the margins chosen for the hypervariable domain swaps. The loss of immunoreactivity when HPV16 L1 domain I is removed supports the conclusion that a component of the 16A epitope is found within domain I. However, it does not rule out that HPV16 L1 domain II does not play a role. Thus, the hypervariable regions within loop domains I and possibly II display a type-specific, conformational epitope, complementing the results of earlier studies [14, 26–33, 42–44]. This is the first study to simultaneously swap multiple hypervariable regions of HPV16 onto a completely divergent L1 backbone. Because papillomavirus L1s are so homologous, even when comparing human to those from other animals, mapping studies may have signal-to-noise ratios potentially influenced by the selected L1 backbone. If, for example, a particular HPV6 epitope is mapped, it should be swapped onto a distantly related HPV L1 or other animal papillomavirus L1 as performed by others . Theoretically, using a less related L1 backbone may allow one to rule out the possibility that other amino acids, which are more conserved between certain HPVs, might modulate antibody binding. However, it has also been shown that certain HPV11-CRPV L1 hybrids failed to assemble into VLPs indicating that some L1 combinations might be too disparate to direct proper folding of the L1 molecule . This may account for our observation that HPV16 domain II was necessary for successful purification of our COPV-HPV16 L1 hybrids. These results from our study suggest that non-contiguous loop regions of L1 display critical components of a type-specific, conformational epitope. This study further confirms that domain swapping is a useful approach to study and map the components of potential type-specific epitopes, complementing the results of others [28, 32, 33]. However, much remains to be learned about the loop epitopes, their contribution to type-specificity and their interaction with the host immune system prior to the construction of a hybrid VLP molecule capable of inducing multiple cross-neutralizing antibodies. This study also used the crystallography data to rationally design the swapping experiments and like other studies [20, 32, 34–37], it further supports the biological relevance of the recently proposed VLP structural model . The GST-L1 system is also novel, and its capabilities were previously unknown. The results of this study also demonstrate that studying capsomeric epitopes in this system is possible. Sf9 cells were cultured in 1X Grace's Medium Supplemented (GIBCO/BRL) containing 10% fetal bovine serum and 10 ug/ml of gentamicin (GIBCO/BRL). The parental baculovirus transfer plasmid pBlueBac IV (Invitrogen) contained either the wild type 114 K HPV16 L1 ORF (pBB114K) or the COPV L1 ORF (pBBCOPVL1). The COPV L1 sequence was amplified by using primers: 5'-ACTGTTTTCGTAACAGTTTTG-3', 5'-ACATGGGGATCCTTTGCCCCAGTGTTCACCTAAAGCTGG-3'. The PCR product was digested with Xho I and Bam H1 and religated into Xho I – Bam H1 site of pBB114K, resulting pBB22. The mutant pBB23 was created by replacing the EcoR I – Hind III fragment of pBB114K with the corresponding sequence from wild type COPV L1 gene. The primers are 5'-TTCTATGAATTCCACTATTATTGAGGATTGGCACCTA-3' and 5'-GGGAAGCTTCACAAGTAATC-3'. The PCR product was digested with EcoR I and Hind III and religated into EcoR I – Hind III sites of pBB114K. All clones were verified by dideoxy-DNA sequencing. The pGEX-4T-2-HPV16 L1 construct was a kind gift from the Garcea laboratory. The COPV L1 gene was cloned into the pGEX-4T-2 vector (Amersham Pharmacia Biotech, Piscataway NJ) as previously described . With slight modifications, the general protocol for assembly PCR was used . For the various loop swaps constructed, restriction enzyme sites unique to COPV L1 and absent from both pGEX-4T-2 vector and the HPV16 L1 loops were used. These sites flank the various hypervariable regions and are as follows. StyI and MunI flank loops I-III, MunI and StuI loop IV, and StuI and BseRI loop V. The 40 mer primer sets were designed so that as many as possible could be incorporated into multiple cDNA synthesis reactions. For example, the 40 mer oligonucleotides for any potential permutation of the D123 swap (i.e. D12; D23; D13, etc.) spanned the restriction sites Sty I to Mun I. The strategy for staggering the 40 mers for this fragment of the L1 gene took into account that the intervening wild type sequences between the hypervariable regions would be common to any D123 swap combination. The design of the D4 and D5 primer sets was more straightforward. For each of these loop swaps, the 40 mers spanned Mun I to Stu I for D4 and Stu I to Bse RI for D5. Once all the possible D123 combinations, D4 and D5 were cloned, any possible permutation of the HPV16 and COPV L1 loop domains could be constructed by simple cutting and pasting directly into pGEX-4T-2 COPVL1. All primers were synthesized by Life Technologies (Rockville MD). Following completion of Step 2, the PCR product was ligated with the pGEM-T vector (Promega, Madison WI) for sequencing confirmation. Following such confirmation, the COPV-HPV16 L1 hybrid loop gene fragments were then digested and inserted into the appropriate sites in the predigested pGEX-4T-2 COPV L1 construct. Positive clones were identified via bi-directional sequencing using primers (Life Technologies, Rockville MD), which were designed with the ability to sequence multiple mutants (i.e. the various primers hybridize with wild type COPV L1 sequences located in between the hypervariable regions). All the primer sequences will be provided upon request. VLPs were prepared as described previously . GST-fusion proteins were purified as described elsewhere . 100 ng of VLPs or 50 ul of GST-fusion protein per well was used for ELISA as described previously (or respectively). The monoclonal antibody 16A  (Rumbaugh-Goodwin Institute, Plantation FL) was used at 1:50 dilution. The secondary antibody, horseradish peroxidase (HRP)-conjugated anti-mouse IgG (Santa Cruz, Santa Cruz CA), was used at 1:1000 dilution. Insect Sf9 cells were seeded on coverslips at 50% confluence and infected with the designated recombinant baculoviruses for three days before fixation with ice-cold acetone. After fixation, the coverslips were incubated with the monoclonal antibody anti-AU1, a conformation-independent monoclonal antibody that recognizes a 6 amino acid epitope found at the C-terminus of many different papillomavirus L1 proteins, at 1:125 (Covance, Richmond CA), or 100 ul of 16A, a conformation-dependent, serotype-specific monoclonal antibody . After 3 washes, the coverslips were reacted with rhodamine-conjugated goat anti-mouse IgG/IgM diluted 1:50 (v/v) in PBS for 1 hour. After washes with PBS, the coverslips were mounted on glass slides with Fluoromount (PanData, Rockville, MD) mounting solution. Cells were viewed and photographed with a Zeiss Axioskop inverted fluorescence microscope. Sf9 cells were harvested by centrifugation and solubilized in sample buffer. Bacteria with GST-L1 recombinant proteins were pelleted and lysed in 100 ul of SDS loading buffer. 15 ul of the total cell extracts was then subjected to electrophoresis in 4–20% precast gels (Invitrogen, Carlsbad CA). Samples were then electrophoretically transferred at to a polyvinylidenefluoride membrane (Millipore, Bedford MA). The immunoblot analysis was performed as described previously . Ten microliters of sample was adsorbed onto carbon-coated grids (Electron Microscopy Sciences, Fort Washington PA) and followed by counter-staining with 2% phosphotungstic acid (pH = 6.8). A JEOL 100S electron microscope was used for visualization at 60 kV. Electron micrographs were taken at 50,000× or 100,000×. Gradients were set-up and analyzed as described previously . This research was supported by an NCI grant (ROICA 53371). We would like to thank Robert Garcea for the PGEX-4T-2 HPV16 L1 construct as well as valuable discussions, Eileen Rusnock for help with the electron microscopy, and Tania Apolinario for help with the bacterial culture. VO performed all of the cloning, synthesis and purification of all of the loop swap mutants, all of the SDG's and TEM analysis of the capsomere preparations. YC performed the cloning, synthesis and purification of the VLPs, and TEM and IF analysis of the VLPs. Both HY and RS extensively mentored the progress of this study.